LOS ANGELES – A new World Champion was crowned last Saturday night at Honda Center in Anaheim, California, when Saul “Canelo” Alvarez defeated Matthew “Magic” Hatton for the vacant WBC Super Welterweight Title, but more importantly, the Mexican phenom made a statement to the boxing world waiting for the arrival of its next star…he has arrived. 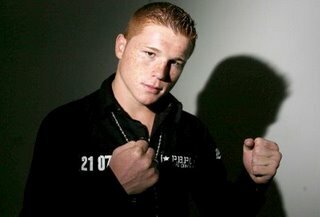 At just 20 years old, not only did Alvarez become the youngest 154-pound World Champion in history, but he also proved himself to be a huge draw with fans as his HBO debut was the most watched HBO Boxing After Dark main event in the past two years, and Televisa’s broadcast of his fight in Mexico produced the highest rating for a boxing program on the network in the last three years. His star power at the gate became evident as well, with attendance at Honda Center being 11,674, making it the second largest boxing crowd in the history of the venue, surpassing the throng of 9,612 that viewed Julio Cesar Chavez’s 1996 win over Joey Gamache (when it was known as the Arrowhead Pond) and being second only to the 12,262 that watched Marco Antonio “Baby Faced Assassin” Barrera defeat Daniel “Cobra” Jimenez in 1995. For more information on Saul “Canelo” Alvarez, visit www.goldenboypromotions.com, follow us on Twitter at www.twitter.com/GoldenBoyBoxing, www.twitter.com/ssab12 or become a fan on Facebook at www.facebook.com/GoldenBoyBoxing.